The 1-1/2″ button is the one in the middle, not too big that people walk out of your event and take off the button but not too small that nobody sees it unless you are on snogging terms. Very popular size! What comes in the box. 1 1-1/2″ #150 Tecre Button Maker 500 1-1/2″ complete button parts – everything you need to make 500 1-1/2″ pin buttons. 25 1-1/2″ Sample Pack free – for fridge magnets, keychains, medallions and flatbacks. 1 1-1/2″ Manufacturers Warranty & Instructions 1 Free Button Guy Button Maker Info DVD includes a Button Guy DVD with templates, instructions & tips. Checkout the blog! The Model #150 can produce 11 different products! -Pin Back Buttons -Tie Tacks/Lapel Pins -Key Chains -Magnets -Versa-Back Buttons (7 styles to choose from) Size: 10″ x 3″ x 6″, Weighs approximately 7.5 lbs Use with optional Graphic Punch Model #1837. 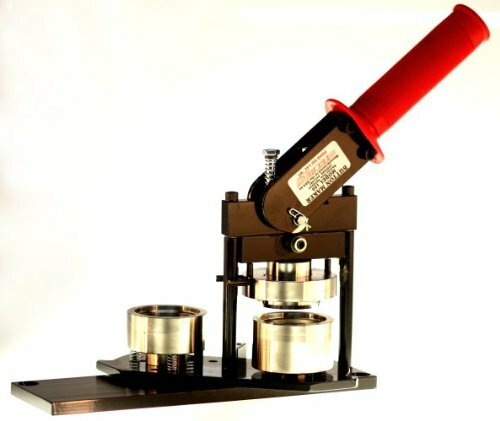 Button Maker is all metal construction with no plastic parts. Made in the U.S.A. This product has a lifetime warranty from the manufacturer.